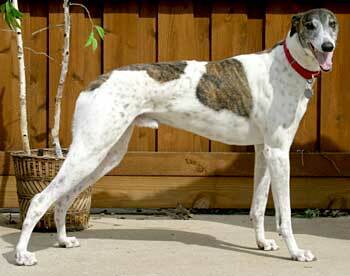 Denny, aka Sam's Denny Go, is a striking almost 5-year-old brindle and white male born May 26, 2002. His sire is Oswald Cobblepot, making his grand sire HB's Commander, and his dam is Dolla Savvy. Denny's racing career began March 21, 2004 at Tri State track in West Virginia, moving on to Birmingham, Alabama and Corpus Christi, Texas, before ending his career March 4, 2005 at Valley Race Park in Harlingen. 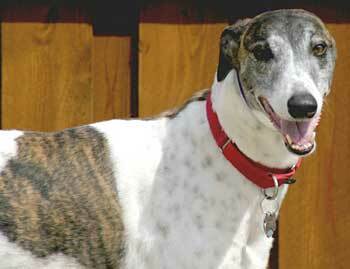 Denny was in a home for a year and a half, but it was not to be his forever home. He was returned through no fault of his own. Denny is not small animal or cat tolerant.